Background: Squamous cell carcinoma is the most prevalent neoplasm of the oral cavity. A strong relationship exists between tobacco smoking and development of oral squamous cell carcinoma. The mortality rate associated with head and neck cancers remains high, and thus detection techniques are important. Oral exfoliative cytology is a simple, noninvasive method that involves microscopic analysis of cells collected from the surface of oral mucosa which can reveal various cellular and nuclear alterations in squamous cell carcinoma. Aims: This study aims to analyze the cytomorphometric changes in smokers and nonsmokers and to compare and evaluate the efficacy of different stains, that is, Papanicolaou, Methyl green-pyronin, and Feulgen stains in assessing the oral smears. Patients and Methods: Study sample consists of 72 healthy individuals of 30–40 years including two groups (36 smokers and 36 nonsmokers) who had no clinically apparent oral mucosal lesions. Three smears were obtained from each subject with oral cytobrush and were then stained separately with Papanicolaou, Methyl green-pyronin, and Feulgen stains. 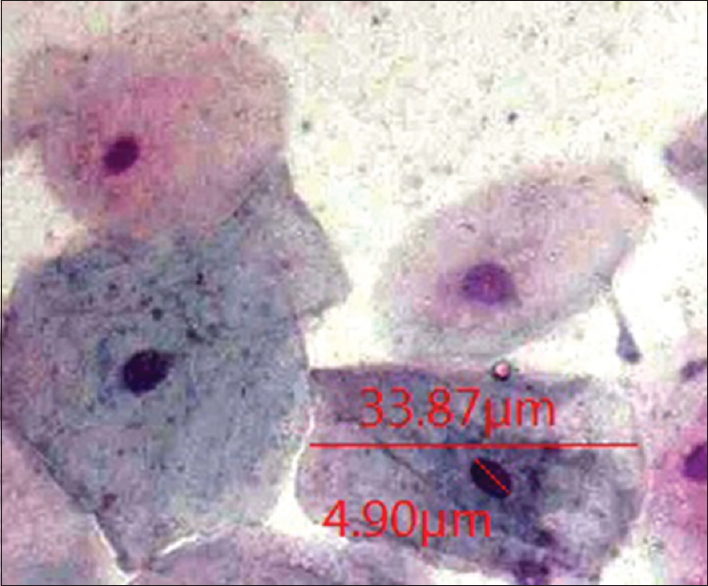 Smears were observed and assessed for cytoplasmic diameter, nuclear diameter, and nuclear color intensity. Results: All three stains in our study showed significant variations in all three parameters between smokers and nonsmokers (P < 0.05). Out of all the three stains, Methyl green-pyronin Y stain proved to give better results. Conclusion: This study contributed to the fact that exfoliative cytology is a simple, noninvasive diagnostic technique for identifying cancerous changes in oral mucosa at an early stage for early intervention. Oral squamous cell carcinoma is one among such pathologies which often goes undiagnosed till advanced stages. Smoking is a common etiologic factor for oral cancers. Nicotine is a major component of tobacco cigarette smoke and has been postulated to play an important role in atherogenesis and malignancy. The mortality rate associated with head and neck cancers remains high, and thus detection techniques are important. Most oral cancers are preceded by precursor lesion, which could be of great help in early diagnosis. 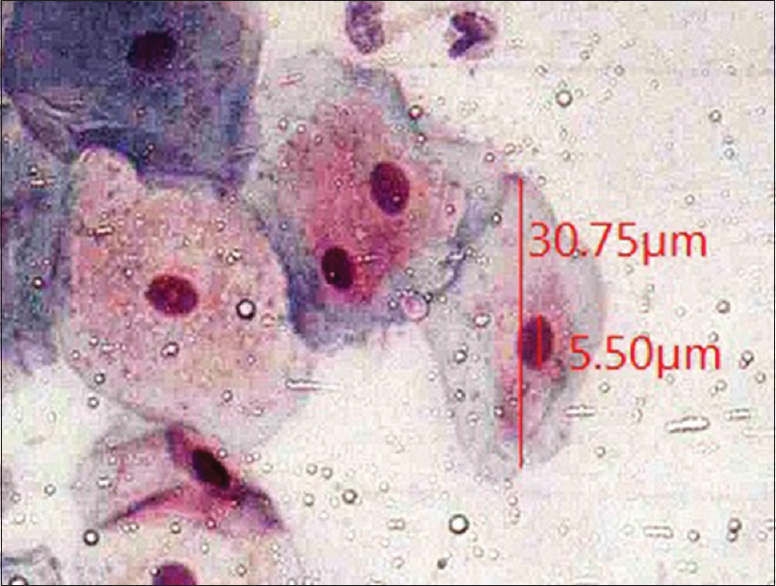 Oral cytology, which is largely based on the presence of nuclear or cytoplasmic alterations, can be easily performed to detect cancer at an earlier stage. Oral exfoliative cytology is a simple, noninvasive, and painless method that involves microscopic analysis of cells collected from the surface of oral mucosa. A fundamental difference between normal cells and dysplastic or tumour cells is proliferative activity of nucleus and nucleolus which increases progressively from normal oral mucosa to oral squamous cell carcinoma. Smoking can significantly increase cellular proliferative activity. For this, we need a practical, easy to apply, and cost-effective method. Methyl green-pyronin Y and Feulgen stains are specific for analyzing the nuclear and nucleolar material and helping in early diagnosis of oral malignancy. Papanicolaou staining is a routinely done technique and was included in the study for comparison with special stains. This study aimed to compare and analyze the morphometric parameters using image analyzer with Papanicolaou, Methyl green-pyronin, and Feulgen staining procedures. The study included 72 male individuals of 30–40 years age group consisting of two groups with control group comprising 36 (nonsmokers) (Group 1) healthy volunteers with clinically normal oral mucosa and study group of 36 smokers (10 years of smoking history and habit of smoking at least 10–15 cigarettes per day) (Group 2) without any clinically apparent oral mucosal lesions. Patients with any clinically apparent oral mucosal lesions and systemic diseases were excluded from the study. Patients with habit of alcohol and gutka chewing were also excluded from the study. A written consent was obtained from reporting subjects after necessary instructions. Ethical clearance was obtained for the same from the Institutional Review Board (BDC/Exam/505/2014-15). Three smears were obtained from each subject with oral cytobrush. After thorough examination of the oral cavity, the patients were asked to rinse their oral cavities and the area to be smeared was wiped of excess saliva and surface debris. Then, the smears were obtained using cytobrush and transferred to dry glass slide and fixed in 95% ethanol. Slides were then stained separately with the following three different stains: Papanicolaou stain, Methyl green-pyronin stain, and Feulgen. The smears were observed and assessed using 20× under Leica DMRB microscope equipped with Jenoptik Germany ProgRes CapturePro version 8.0.8 image analysis software and ImageJ 1.46r Java 1.6.0_20 (64bit) software. For each slide, 20 epithelial cells were selected randomly in different fields. The cytomorphometric features studied were cytoplasmic diameter, nuclear diameter, and mean color intensity. 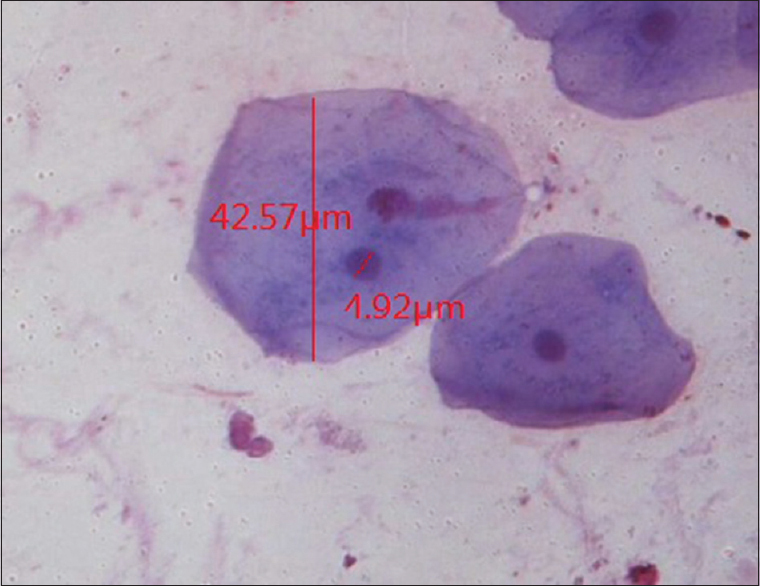 The mean nuclear diameter value obtained with Pap stain in healthy individuals [Figure 1] was 5.19 μm, whereas in smokers [Figure 2] it was 6.13 μm [Table 1]. The mean nuclear diameter value obtained with Methyl green-pyronin Y stain in healthy individuals [Figure 3] was 5.48 μm, whereas in smokers [Figure 4] it was 6.30 μm [Table 1]. The mean nuclear diameter value obtained with Feulgen stain in healthy individuals [Figure 5] was 5.17 μm, whereas in smokers [Figure 6] it was 5.94 μm [Table 1]. There was an increase in mean nuclear diameter in smokers compared with healthy individuals. There was a statistically highly significant change in the values with all the three stains, that is, with Papanicolaou, Methyl green-pyronin Y, and Feulgen stain (P < 0.001) [Table 1]. 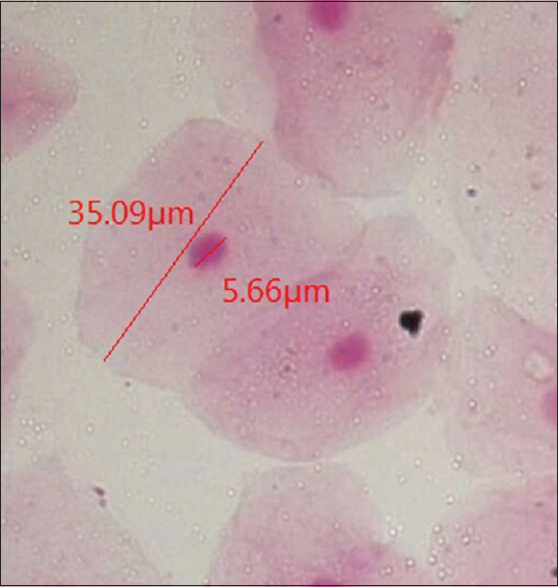 The mean cytoplasmic diameter value obtained with Pap stain in healthy individuals [Figure 1] was 36.63 μm, whereas in smokers [Figure 2] it was 31.66 μm [Table 2]. The mean cytoplasmic diameter value obtained with Methyl green-pyronin Y stain in healthy individuals [Figure 3] was 37.46 μm, whereas in smokers [Figure 4] it was 31.11 μm [Table 2]. The mean cytoplasmic diameter value obtained with Feulgen stain in healthy individuals [Figure 5] was 35.45 μm, whereas in smokers [Figure 6] it was 31.08 μm [Table 2]. There is a decrease in mean cytoplasmic diameter in smokers compared with healthy individuals. There is a statistically highly significant change in the values with all the three stains, that is, with Papanicolaou, Methyl green-pyronin Y, and Feulgen stain (P < 0.001) [Table 2]. The mean color intensity value obtained with Pap stain in healthy individuals was 76.27, whereas in smokers it was 83.93 [Table 3]. The mean color intensity value obtained with Methyl green-pyronin Y stain in healthy individuals was 77.93, whereas in smokers it was 86.92 [Table 3]. The mean color intensity value obtained with Feulgen stain in healthy individuals was 77.07, whereas in smokers it was 82.07. There was an increase in mean nuclear color intensity values in smokers compared with healthy individuals. There was a statistically significant change (P < 0.05) in the values with both stains, that is, with Papanicolaou and methyl green-pyronin Y. Color intensity values did not show significant variation with Feulgen stain between smokers and healthy individuals (P > 0.05) [Table 3]. In our study, three different stains, that is, Papanicolaou, Methyl green-pyronin Y, and Feulgen stains were compared to evaluate the efficacy of stains in assessing the oral cytosmears. Of all the three stains, Methyl green-pyronin Y stain proved to give better results in terms of overall clarity, consistency, and details [Table 4]. Smoking is currently the most preventable cause of diseases and death worldwide and is one of the main risk factors for the development of cancer in different organs. Therefore, smoking patients should be carefully monitored in view of the series of alterations that tobacco can cause. Many cases of oral cancer are diagnosed at advanced stage, a fact that results in an unfavorable prognosis and high mortality, in addition to high treatment costs coupled with an increased number of complications. Thus, early diagnosis is of extreme importance in managing this disease. During the transformation of normal tissue to premalignant or malignant tissue, cellular changes occur at molecular level, much before any clinical or even histological changes are evident. Identification of high-risk individuals even before any potentially malignant lesions are present in oral mucosa could constitute one of the keys in reducing the mortality, morbidity, and cost of treatment associated with oral squamous cell carcinoma. Considering the possible influence of smoking on the occurrence of oral cancer and precursor lesions, together with the accessible location of the lesions which permits easy visualisation and collection of material for analysis, exfoliative cytology might be a useful tool for the detection and monitoring of initial alterations and for the establishment of adequate treatment in smokers which was the motto of our study. Buccal mucosa was selected as the primary site for collection of smear sample. The reason for selecting this site in oral cavity was, as stated by Baric et al., that cells removed from buccal mucosa are the principal cells for assessing changes occurring in oral mucosa due to smoking. Individuals of only 30–40 years age group are included in this study. The lower limit of age group was taken as 30 years as a minimum of 10 years duration of smoking habit was one of the inclusion criteria, and the upper limit of the age range was taken as 40 years to avoid the effect of age-related changes or any underlying systemic diseases. Oral epithelial cells have a decreased turnover, so cells remain in cell cycle for longer periods resulting in a delayed cell division. As a result, proteins that are synthesized within the nucleus divide slowly, which in turn increases the nuclear size. The cellular changes seen in this study can be partly attributed to the fact that tobacco on consumption releases various by-products such as nitrosamine and nitrosonornicotine, which can influence cellular morphometry. Decrease in cellular diameter and increase in nuclear diameter are two significant morphologic changes that occur in actively proliferating cells. The amount of cytoplasm that a cell makes decreases relative to the amount of nucleoplasm, so that when there is an actual increase in nuclear size, the cell diameter decreases. The increase in the size of the nucleus may be related to the increased amount of DNA required for cell replication. The reduction in cytoplasmic diameter in smokers can be attributed to dehydration which is a kind of cell adaptation in response to the decrease in fluids, especially saliva around the cell. While comparing the various cytomorphometric parameters in this study, an increase in mean nuclear diameters and a decrease in mean cytoplasmic diameters in smokers when compared with nonsmokers were observed. There was also an increase in mean nuclear color intensities in smokers compared with healthy nonsmoker individuals. Smoking-induced cellular adaptations can be considered as the primary reason causing increase and decrease in nuclear diameter and cytoplasmic diameter, respectively, as found in this study. Smoking often leads to cellular irritation thereby causing increased proliferative activity of the cells resulting in cellular morphologic changes. When the three stains used in the study were compared, Methyl green-pyronin Y stain proved to better among the three as the smears appeared more crisp and had better nuclear detailing but less economical than the other two stains. Our study aims to find out the effect of tobacco smoking on development of cytonuclear alterations in oral mucosa. Therefore, this study only included patients who were not anemic and had not given any history of radiotherapy, chemotherapy, or habit history of alcohol consumption and gutka chewing. Therefore, the effect of the above-mentioned confounding factors was eliminated in this study. To exclude the effect of age and gender on the obtained results, almost all the samples were men and age-matched. 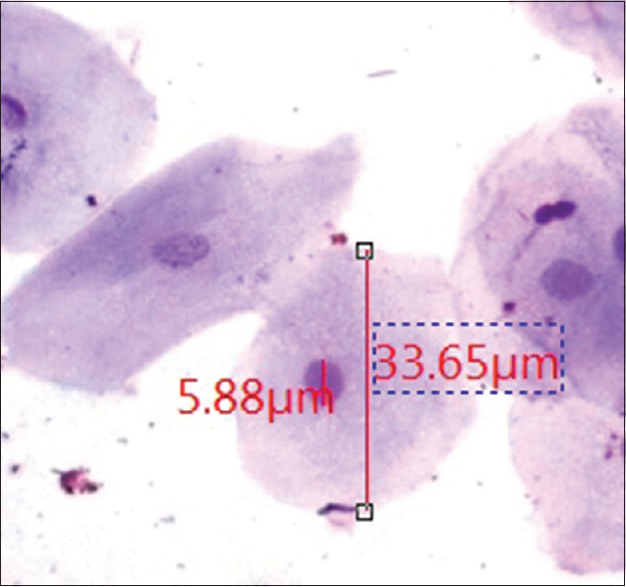 The results obtained in the study were encouraging and showed that exfoliative cytology aided with computerised image analysis can be used as useful diagnostic tool in identifying risk markers like increase in nuclear diameter and decrease in cytoplasmic diameter thereby detecting the pre-malignant changes before the occurrence of any visible change in oral mucosa. The limitations of the study were that nonsignificant results were obtained for color intensity using Feulgen stain and color intensity did not prove to be a very reliable parameter to be used as risk marker in smokers. Further research is needed regarding color intensity as less literature is available regarding its use in assessment of cytosmears. Further studies can be done on larger samples with Methyl green-pyronin Y stain to evaluate its efficacy in identifying cytonuclear alterations in oral epithelial cells to use it in mass screening procedures. Behavior intervention to quit smoking may be greatly facilitated if the subject is aware of risk markers that have been identified in the clinically normal oral mucosa. Therefore, Methyl-pyronin Y stain, being a DNA-specific stain, can be used along with routine stains like Pap to screen individuals with smoking habit who are at more risk of developing oral squamous cell carcinoma. This study contributed to the fact that exfoliative cytology is a simple, good, noninvasive diagnostic technique for identifying cancerous changes in oral mucosa at an early stage for early intervention. Smoking is a preventable risk factor for oral cancer. Therefore, using this technique smoking habit can be intervened by enlightening the smokers with changes occurring in their oral mucosa before the evidence of any visible oral mucosal lesion. Hande AH, Chaudhary MS. Cytomorphometric analysis of buccal mucosa of tobacco chewers. Rom J Morphol Embryol 2010;51:527-32. Mohtasham N, Mahdavi N, Salehinejad J, Ejtehadi H, Torabi-Parizi M, Ghazi N, et al. Detection of nucleoproteins in squamous cell carcinoma, dysplastic and normal mucosa in oral cavity by Methyl green Pyronin staining. J Oral Sci 2010;52:239-43. Abdelaziz MS, Osman TE. Detection of cytomorphological changes in oral mucosa among alcoholics and cigarette smokers. Oman Med J 2011;26:349-52. Goregen M, Akgul HM, Gundogdu C. The cytomorphological analysis of buccal mucosa cells in smokers. Turk J Med Sci 2011;41:205-10. Reddy VS, Kumar GS, Vezhavendan N, Priya S. Cytomorphometric analysis of normal exfoliative cells from buccal mucosa in different age groups. Int JClin Dent Sci 2011;2:53-6. Parmar D, Sawke N, Sawke G. Cytomorphometric analysis of buccal mucosa cells in tobacco chewers. Astrocyte 2015;1:288-91. Bahrani AJA. 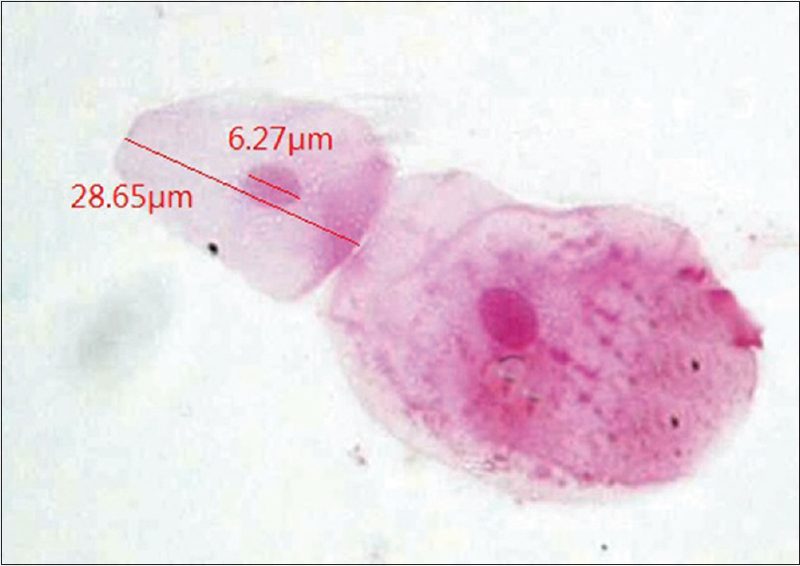 Evaluation of the cytological changes of oral mucosal cells in Smokers by using exfoliative Pap Stain. MDJ 2013;10:124-9. Shetty R, Mukherjee S, Dutta N, Bhagat DK, Sushma K N, Pandey V, et al. Cytomorphometric analysis of oral squames tobacco smoker's using oral brush biopsy: An exfoliative cytological study. IAIM 2016;3:14-9. Ramalal G, Reddy GV, Venkateswarulu N, Shalini K, Patil R. Significance of oral brush cytology of oral mucosal lesions in gutka chewers- A prospective study. J Indian Acad Oral Med Radiol 2011;23:539-42. Seifi S, Feizi F, Mehdizadeh M, Khafri S, Ahmedi B. Evaluation of cytological alterations of oral mucosa in smokers and water-pipe users. Cell J 2014;15:302-9.